Los Angeles, the city of Angels! After having driven around four beautiful states in America, we ended our road trip in this beautiful city. 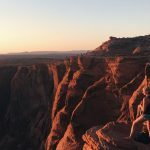 Still filled with impressions of our drive through Utah, Arizona and the rest of California, we were excited to add this beautiful city to our list. 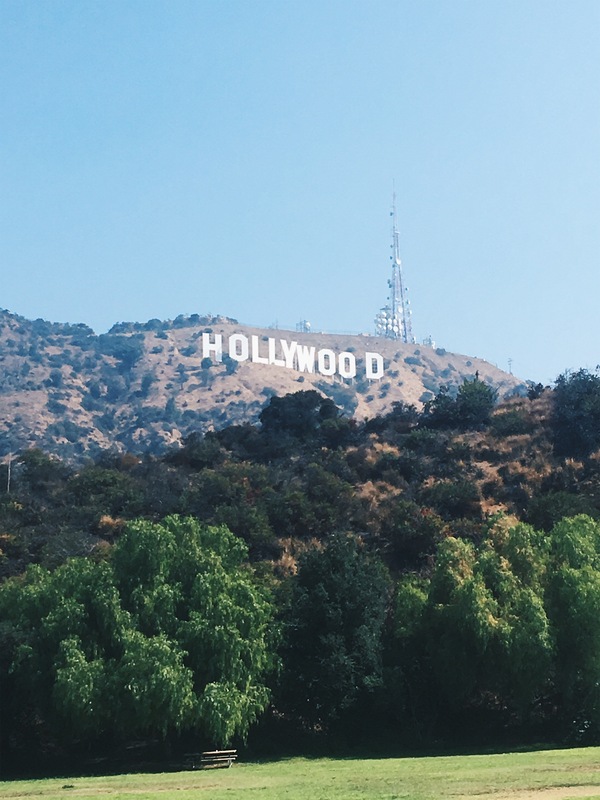 Of course, the famous Hollywood sign is a must-see for a trip to Los Angeles. It was my first time on the west side of the states, so it was our first stop in LA. We drove to Lake Hollywood Park to take a few photos and walked up the street to get even closer. Luckily it wasn’t too busy! Afterwards, we drove through the neighbourhood, soaking up all the sights of the famous Hollywood. After seeing the sign, we continued our Hollywood drive to the famous Walk of Fame. We parked the car in one of the nearby shopping centers and started walking up and down the street. It was so surreal to see these in real life after having seen them on television and the internet so often. While walking we spotted so many recognizable names. We got to walk around some of the gift shops and buy some souvenirs for our friends and family. When I mentioned my trip to California on Twitter, I was urged to try out “In-N-Out” burgers – this is where we went for lunch. None of my family is vegetarian and when I stay with them I usually adjust my diet to make it easier for them and myself. Whilst in the states, you kinda have to try the burgers there – right? I’m not gonna lie, these burgers were fab. Probably the best I had during my road trip. 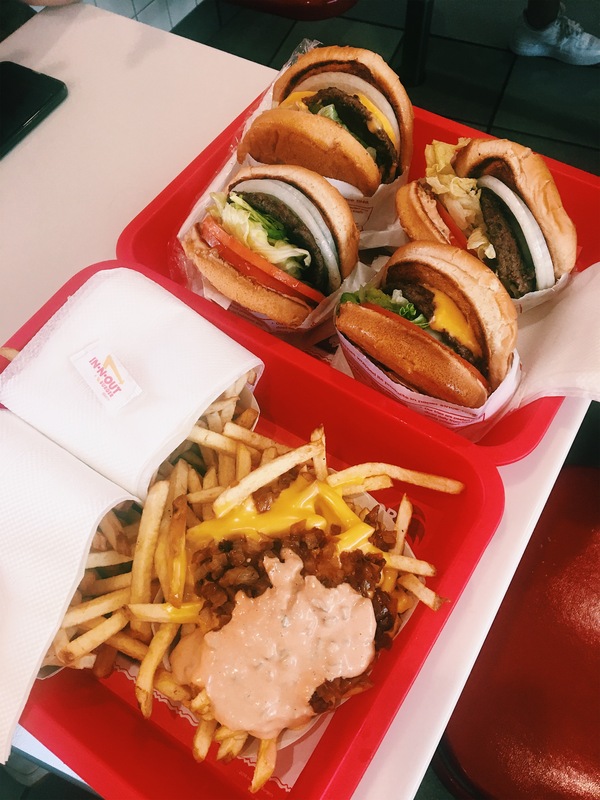 Alongside with the special “animal style fries” – I didn’t try these but my sister loved them! 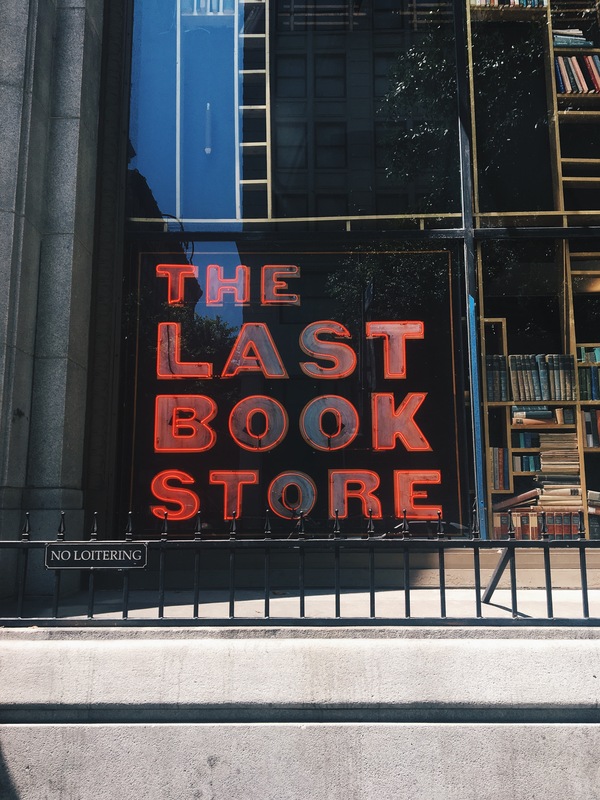 After visiting the beautiful City Lights Bookstore in San Francisco earlier that week, I was even more excited to visit The Last Bookstore. 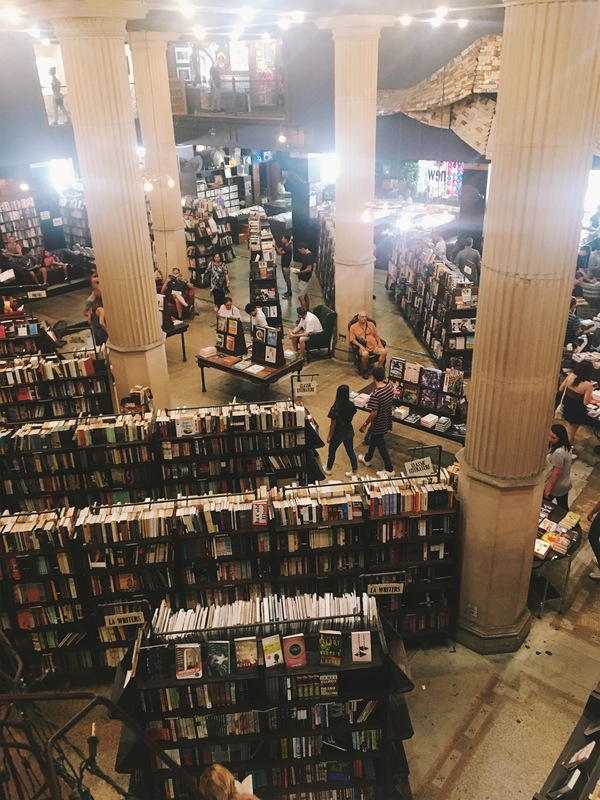 It’s the largest bookstore in California and also known as “most instagrammable bookshop”. Need I say more? Luckily I was able to spend quite a while in this shop, but I think I could’ve easily spent a whole day browsing through the aisles. In the end, it was probably a good thing I didn’t have more than a couple of hours – my suitcase was already on the heavy side! When in Los Angeles and the Dodgers are playing a home game, you kinda have to go and see them! The atmosphere at a real American baseball game is something out of this world. It was amazing! I’m not a sports gal, neither do I know the rules of baseball but I loved being at the game. It was such a unique experience. The cheering, the hot dogs, the songs played and the excitement of the fans. 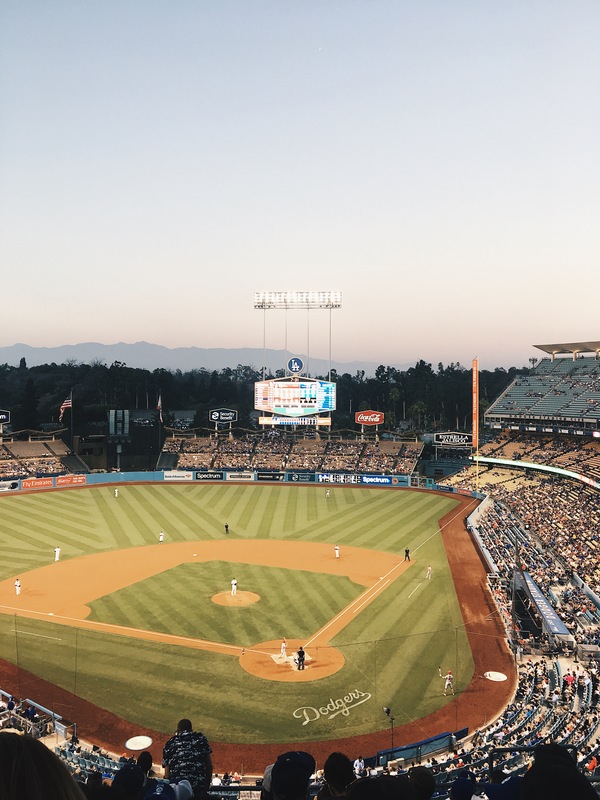 If you ever get the chance to see a baseball game – even if you’re not really that into sports – give it a go! 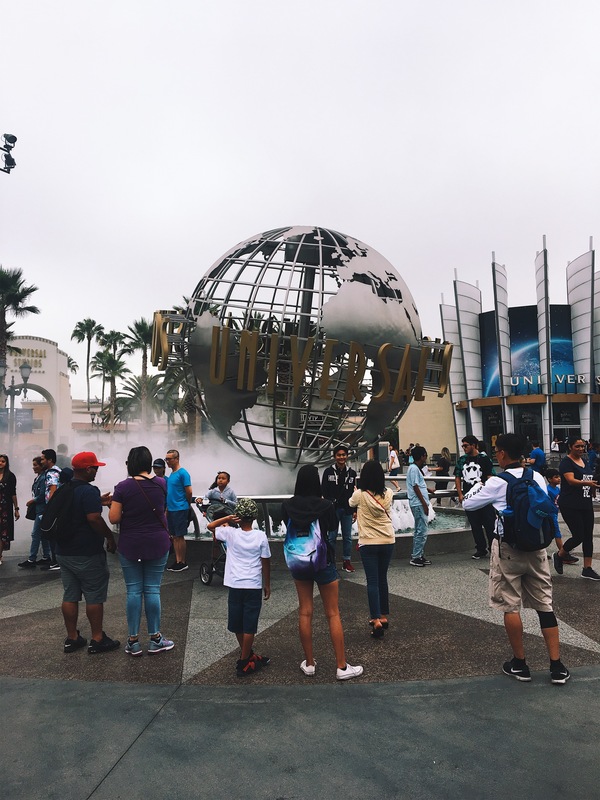 One of our days in Los Angeles, we visited Universal Studios Hollywood. 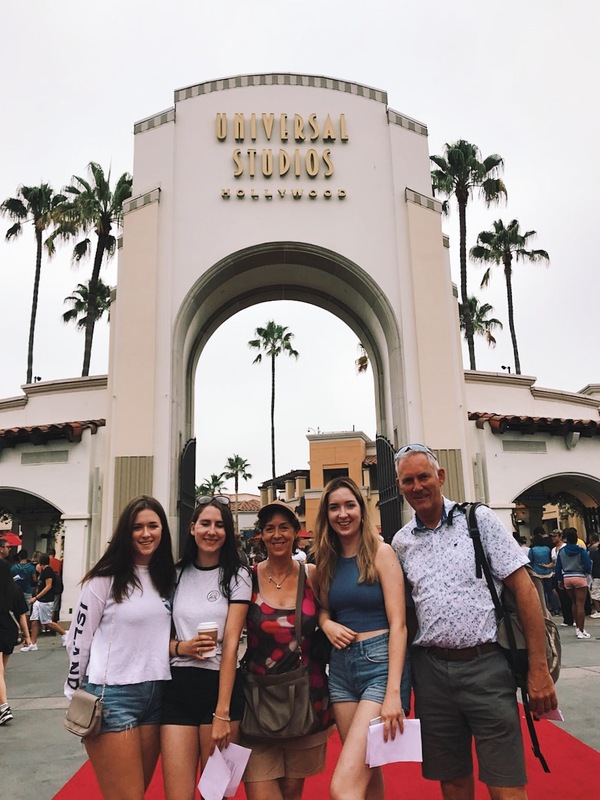 We didn’t really check the days when we booked our tickets, but we ended up going on a Saturday (something I would discourage you to do if you are planning on visiting the theme park – it was VERY busy!) Nonetheless, we were able to see and do everything we wanted to do! We started our day with the studio tour, which ended up being one of my favourite things in the park! Seeing the sets of famous movies was simply amazing. Harry Potter world was another thing I was really looking forward too. When we went to Ollivanders, I got picked out for the wand picking! 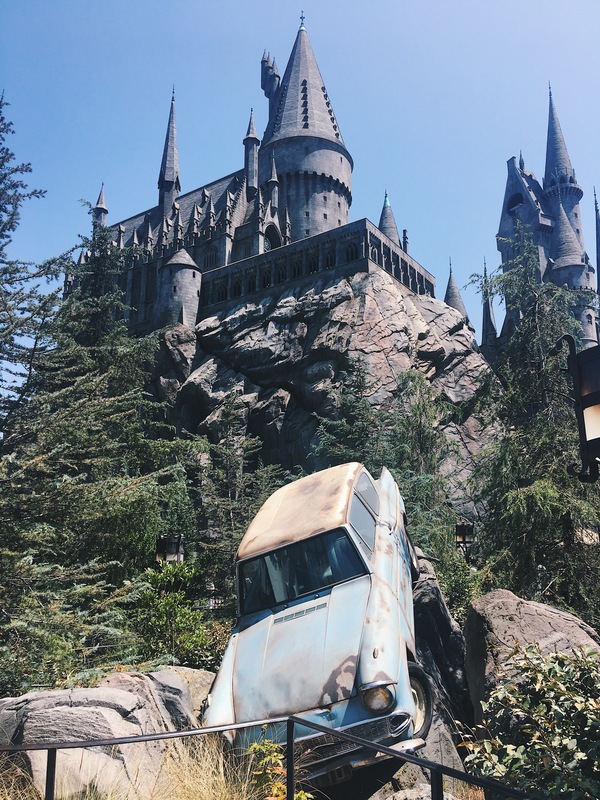 We also got the chance to ride on the new Harry Potter and the Forbidden Journey, which kinda disappointed me. I expected it to be more like a rollercoaster. Instead, it was a 4D ride and it made me feel really sick. Such a big and lively city is barely seeable in such a short period of time. It deserves more time to be explored properly! I really hope I get the chance to go back someday and live that Californian lifestyle for another week or two. What would you like to see/do? Los Angeles is somewhere I long to go. It sounds like youbhad an amazing time. Everywhere you visited is definitely on my LA bucket list. In and out burgers 🍔 looked so tasty. I’m going to LA in a few weeks! This is very helpful, thanks! 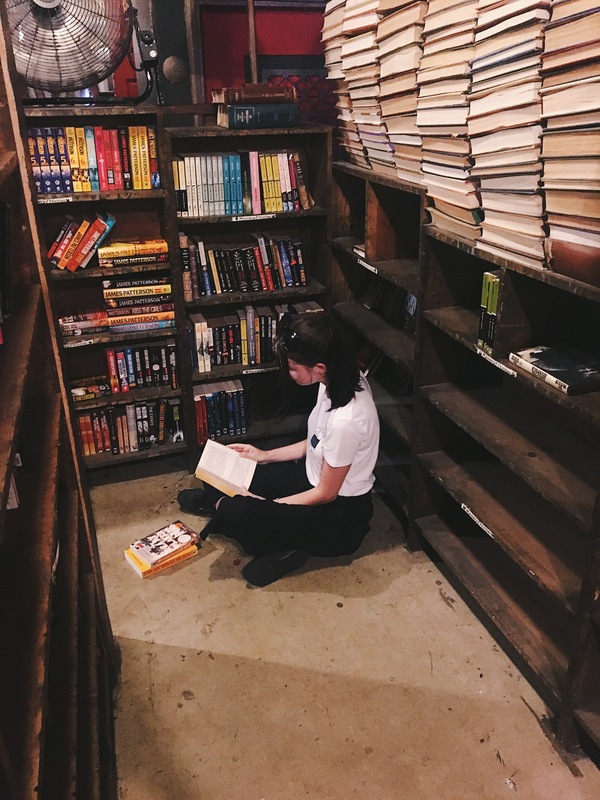 I absolutely love the Last Bookstore and I go there quite a lot because I live in Los Angeles. Another fun LA thing is Santa Monica Pier. Right now they have a free concert series, there is the beach, of course, and so many fun things on the Pier. Omg this looks absolutely incredible! 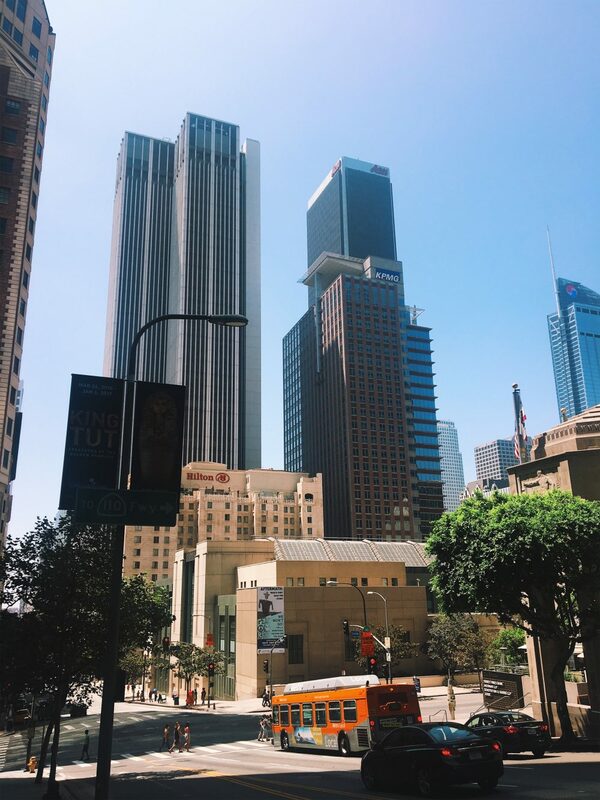 Thank you for sharing your gorgeous photos, too – I’m currently saving up to visit LA so it’s really lovely to get an insight through your blog post! 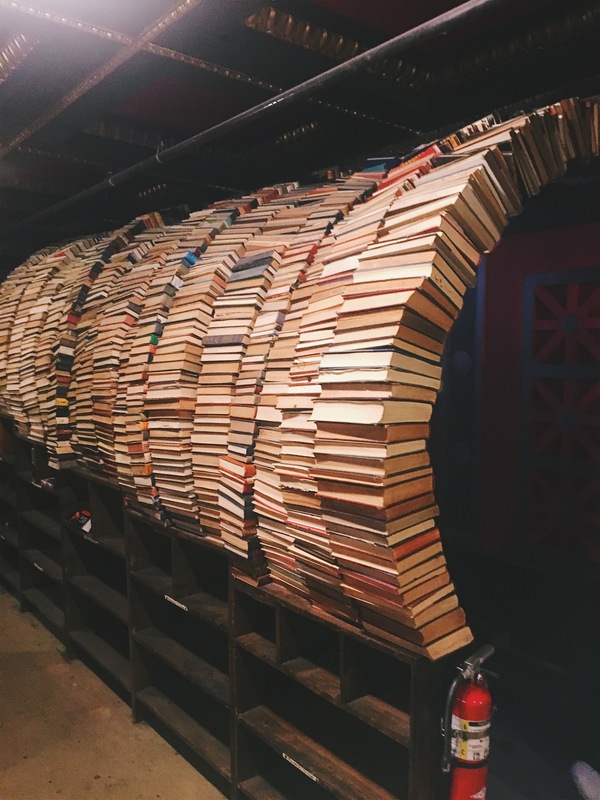 I’d never heard of The Last Book Store and it looks unbelievable – definitely added to my must-see places! So glad you had such a wonderful time! Great post. I’ve been to L.A. a few times now and always find something new to do. We rented a car one day and drove around the Hollywood hills checking out all the big houses. You get great views too. Santa Monica is really nice, love hanging out on the pier or walking the beach. La Brea tar pits was a good museum too. Thanks for sharing! Interesting article. 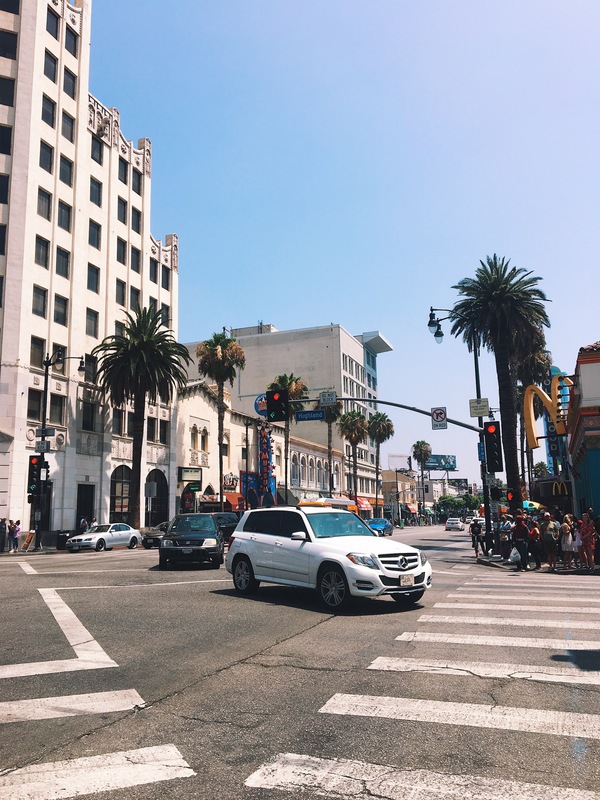 My old dream is to rent a luxury car and drive along the Walk of Fame! 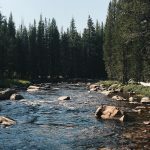 Stumbled upon this article and love it! You covered a lot of awesome sights! Having a look around but so far, loving what we see! That book shop looks AMAZING! And In N Out burger is the best, haha. 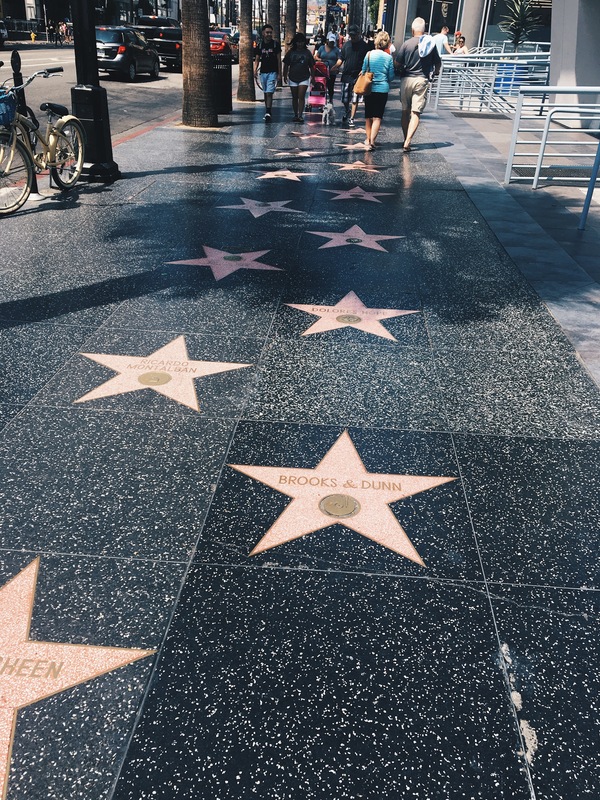 I was a little bit underwhelmed by the walk of fame to be honest – the handprints and footprints outside the Chinese theatre are MUCH cooler! Sounds like you had an awesome time!